Celebrate MSC Sustainable Seafood Day at Fish & Co.
Friday, March 31st is MSC Sustainable Seafood Day 2017. It’s the Marine Stewardship Councils (MSC) annual national event encouraging people to enjoy MSC certified sustainable seafood. At Fish & Co. we celebrate wild-caught, sustainable seafood every day and use many MSC-certified fish species on the menu: NZ Hake, NZ Hoki, Alaskan Salmon, QLD Albacore Tuna, Alaskan Cod, Gulf of Carpenteria Prawns and South Australian Coorong Yellow Eye Mullet. On Sustainable Seafood Day support the MSC by dining with us or simply purchasing seafood from us to take home and cook. Many of our regular customers are now taking advantage of the convenience of our frozen Alaskan salmon fillets by purchasing in bulk and filling the freezer for future meals. 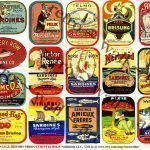 Check out our range of seafood products in our online shop. A little bit of info on the MSC….. The MSC works with scientists, fisheries, seafood producers and brands to promote sustainable fishing and safeguard seafood supplies for the future. We set credible standards for sustainable fishing and supply chain traceability. Organisations meet these standards in order to demonstrate the sustainability of their products. The blue MSC label makes it easy for everyone to choose seafood which has been caught by fisheries which care for the environment. You can trust that fish and seafood with the blue MSC label has been responsibly caught by a certified sustainable fishery. Look for the blue MSC label when doing your supermarket shop. Our Queensland tuna supplier, Walkers Seafood were granted their MSC certification in 2015 for Yellowfin, Swordfish and Albacore after many years of working towards meeting the certification criteria. They were the first in Australia and the only sashimi grade MSC Yellowfin available in the world to achieve this certification by the MSC. We consistently feature their Albacore tuna on our menu. 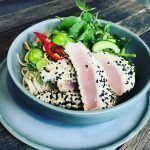 At the moment our Tuna Salad Soba Noodle Bowl (a big but tasty mouthful of words) is very, very popular! Sustainability should be part of your seafood purchase decision. Seafood doesn’t have to come with a label to be sustainable but you do need to know where it’s from and how it was caught and it’s always nice to see the faces of the people who catch it – check out Walkers Seafood Sustainable Seafood story.